Clad in their black dresses, black wide-brim sunhats and black lipstick and eye makeup, the Black Belles are wholly dedicated to their image. After watching several monochromatic music videos online and seeing numerous black and white promo photos, it’s almost astounding to see that they aren’t actual film noire characters – but actual flesh and blood people in real life. The Nashville, TN all-female band can be described as “garage goth” – the “goth” part if only for their attire, but also for the singer Olivia Jean’s snarling delivery in each song. Their bio states there are four members, but it appears Tina NoGood (keys/organ) did not accompany the band to Canada. After introducing each song with a charming smile, Olivia Jean transformed into a wicked banshee with a piercing gaze and fast guitar hand. 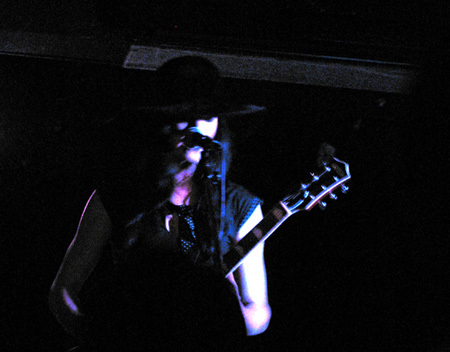 The Garrison was clearly at capacity for their performance – perhaps out of curiosity due to the Black Belles’ connection to the White Stripes’ Jack White (they’re signed to his label, Third Man Records). However, the Black Belles held their own and showed they’re a real live band with rocking chops to boot.